Start your research journey here! Doing research is a key activity of the History Fair. The sources found will help build knowledge, provide the images, text, and audio-visual evidence to develop an argument, and make the final project come alive. Every History Fair project must have an annotated bibliography that is based on the research completed, so take good notes and record all the citation information while doing research. Take notes using your own words, but if you are directly taking from the source remember to use quotations marks to avoid plagiarism. Start your work with tips from the Research Journey PowerPoint. If you want additional help, come out to our RESEARCH PALOOZAS at local libraries and universities. Secondary sources are crucial to History Fair. They include books, documentaries, and magazine, newspaper, or professional journal articles written by historians and other writers. All historians spend time with secondary sources to build basic knowledge and to learn from what others have thought about the topic. Reading different historians’ articles and books will add depth to a project. There are different types of secondary sources for each stage of research. Follow the Secondary Source Trail. Primary sources make history come alive because they are made for and during the time in history. Actual witnesses and participants also count as primary sources. 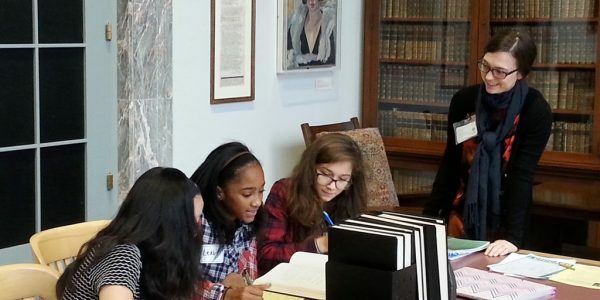 These sources distinguish a History Fair project from a mere “report” since students must find primary sources and then analyze and connect them to form their own interpretations. The wider and deeper a student goes into primary sources the more they will grasp their subject and gain credibility. Please review The Stuff of History (a handy list of types of potential primary sources). While some primary sources will be found within secondary sources, History Fair researchers will seek quality sources online through “portals” and digital collections and also will go to Special Collections Libraries and Archives. Chicago in Maps contains various important historic and thematic maps of Chicago. The History Fair page in the Research Center lists CHM digital collections (such as Haymarket Affair, Lincoln, and the Chicago Fire), and also provides the search engine for the Research Center’s primary and secondary sources, as well as the required reservation form. More digital primary source material may be found within the lessons in Classroom Resources, and at the website for Facing Freedom. Search the catalog for books, or browse Chicago History for guides to special collections, helpful timelines, and primary sources. The History Fair page in Online Resources gathers the top databases for research. The Chicago Public Library digital archival collections cover a wide array of topics including the Civil War, Chicago theater, Northside Neighborhoods, Harold Washington, the sensational newspaper The Examiner, and the Chicago Renaissance. Chicago State University’s Archives and Special Collections digital collection includes manuscripts and images that reflect the historical, literary, and academic traditions of Chicago State University and the south side community of Chicago. Of note are Historical Photographs, The Progressive Education Collection, and The Last Days of Maxwell Street. The DePaul Digital Library is composed of digitized books, manuscripts, images, maps and other materials. Of particular interest to History Fair students will be the Community Collections (including materials pertaining to the Young Lords and Lincoln Park) and the Selected Maps Collection. Digital copies of older history books and other printed material on Illinois and Chicago. There is a special feature on defunct amusement parks throughout the state too. An excellent portal to many of the special collections’ holdings that can be found in the city. The Illinois Digital Heritage Hub is the newest hub on the Digital Public Library of America (DPLA). The collection is a collaboration between the Illinois State Library, the Consortium of Academic and Research Libraries in Illinois (CARLI), Chicago Public Library, and the University of Illinois at Urbana-Champaign. The hub brings the stories and voices of Illinois residents and helps DPLA draw unique connections between broad national themes in American history and the lived experience of individuals and local communities. Digitized the collections from the Illinois State Historical Library and other libraries and historical societies from around the state. From Pre-Fire Chicago to Abraham Lincoln to World War 2 documents, the archive provides under-used primary sources with accompanying background information.. The Loyola University Chicago Digital Special Collections includes materials about the history of Chicago, as well as those unique to the history of Loyola and its religious affiliates. History Fair students may be interested in viewing the Chicago Images, Columbian Exposition, Century of Progress collections. The local history department compiled this list of key research websites. Primary-source documents and essays by scholars that are arranged by topics (many based in Chicago). Houses a number of digital collections: Early Illinois, Gilded Age, Lincoln, Civil War. It also holds the back issues of Illinois History Teacher and other state government magazines. The University of Chicago Special Collections Research Center offers a wide array of digital materials available online. Of note are various Chicago map collections, Chicago jazz, portions of the Ida B. Wells papers, and materials from the 1933 Century of Progress. The University of Illinois at Chicago Library provides access to more than 60,000 digitized images, relating to topics such as the University’s history, medical history, and the Chicago-area history and culture. Of note are the Cook County Forest Preserve Collections, photos from seven settlement houses (including Hull-House), Richard J. Daley Era Photographs, and the Puerto Rican Cultural Center collection. WLA houses the manuscripts and papers of key women activists and organizations involved in politics, arts, feminism, religion, and social justice. A mammoth collection of primary sources based on Hull House (and related Chicago issues) from 1889-1963. In addition, there are essays by scholars. Search America’s historic newspaper pages from 1834-1922 or use the U.S. Newspaper Directory to find information about American newspapers published between 1690-present. The Library of Congress website has many avenues to explore that will lead to a wealth of primary source material. Also check out the LOC primary sources spotlights on Illinois history and Chicago history which TPS-Barat pulled together for its Primary Source Nexus site. The Gateway provides a custom search engine for history websites. In addition, there are interviews with scholars on a number of Chicago-related topics. Find relevant articles on Chicago events of national importance and also use the “recommended history website” feature to discover more quality sites on specific topics. The Internet Archive offers permanent access to historical digital collections. The collections include texts, audio, moving images, and software, as well as archived web pages. Search millions of historic photos from the 1860s to 1970s! 19th century publications scanned and searchable. ARC is the database that will lead students into the vast holdings of the National Archives-at least 20 per cent of it! New York Public Library Digital Collection has over 4,000 images related to Chicago history and over 1,500 images related to Illinois history. The collection includes photos and other items from the 1893 World’s Fair and the Great Chicago Fire, as well as images from the 1919 race riots, local architecture and landscapes, portraits of individuals, and advertisements. Primary sources on women include a number who were active in Chicago such as Ida B. Wells and Florence Kelley. Available at DePaul, NEIU, and UIC libraries. A number of the websites above will contain audio-visual sources too. While these sources are crucial for documentaries and websites, all researchers can gain primary and secondary source information from them. Chicago’s public cable station, is a great source for recordings that may be useful for either primary or secondary sources depending on the whether it is an interview/panel with participants or interview/recorded speech of an expert or scholar. Many times the CuriousCity folks will investigate historical questions and development some great products. Look for their resources too! A video archive of African-Americans in Chicago and the nation. Searchable by person or by keywords. Available through the Chicago Public Library’s Online Resources. A collection of documentaries by Chicago independent filmmakers over the last 40 years. Some real treasures! Hundreds of interviews with artists, writers, musicians, politicians and activists provide unique and important insights to many History Fair topics. Special Collections and Archives contain the saved material of people, organizations, and businesses. Often the only copy of a flier or brochure, newsletter, photograph, meeting minutes, reports, and letters are available at these institutions. Not all sources exist online—they form only the tip of the iceberg—and there is much more to discover by spending time at a special collections and archives. Each library contains different, unique material which are called “manuscripts and papers” or “records.” Their online finding aids may indicate whether there is material to be found, but also use the “Ask the Librarian” function to see what they recommend. Most libraries have set hours and advise making an appointment. Please review How to Use a Finding Aid. The Archives of American Art provides a list of where to find the archives for artists connected to Chicago. The Black Metropolis Research Consortium Survey serves as a database of collections pertaining to the Black Chicago Metropolis. Use the search engine ARCHIE to search for the “Manuscripts and Records” of people and organizations. ECC contains not only thousands of digitalized images, but also the finding aids from which all the collection came so that researchers can follow-up to find more and different types of sources. A key resource for primary and secondary sources on Lesbian, Gay, Bisexual, Transgender, and Queer issues. Mapping the Stacks provides information about a variety of uncatalogued archival collections that focus on Black Chicago between 1930s and 1970s. The collections include literary manuscripts and visual illustrations; rare books and home movies; correspondence and photographs; ephemera and tape-recorded sound. Among government documents, many pertaining to Chicago, is a collection of photographs of Black Chicago in the 1970s. The Great Lakes Regional office of NARA is located at 79th and Pulaski; personal help by staff and access to documents and microfilm. The Newberry Library’s Digital Resource page provides access to materials in their collections (as well as the library’s catalog).